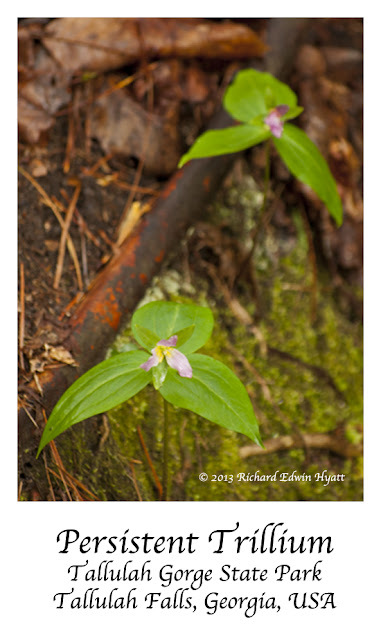 The Persistent Trilliums are blooming this morning at Tallulah Gorge State Park. We found several. You do have to look pretty hard to find them. They are on the endangered species list and only are found in a few counties of NE Georgia and NW South Carolina. These are for the most part within 4 miles of Tallulah Gorge (Tallulah Falls, Georgia). I have found that they usually are in bloom for about 3 weeks in the spring. The flower is small and often bends over a bit making them fairly hard to photograph.